All of the fabrics in our collection can be made into curtains, romans, cushions, tie backs and valances for a perfectly co-ordinated look. Classic stripes, the English country garden, nature inspired patterns and the fresh colours of Scandinavian design are hot themes this season and our fabrics fit these trends perfectly. 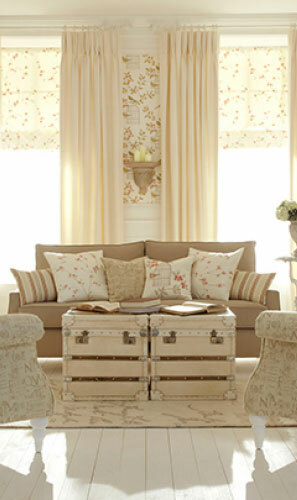 All our curtains are fully lined with a sateen twill fabric for a fuller, more luxurious appearance. This lining also helps to prevent colour fading, reduces light coming into the room and provides additional privacy. We also offer a thermal lining that cuts down the amount of heat that can be lost through the window, and a blackout lining which has two layers of sateen twill fabric bonded around a black membrane to block light. A fine selection of metal and wooden poles and finials are available in variety of colours and stains. There are four options including ‘Aluglide’, a light yet strong aluminium track that can be shaped to fit bay windows. ‘Ultraglide’ is a corded steel track with a cord at the side, that makes opening and closing curtains a smooth operation. Maximise the light coming into a room with stylish curtain hold-backs. They’ll also make the most of a great view. Match them to your curtain pole for a totally co-ordinated look.